Temps have dropped yet a little more on the grassy banks of the Upper Owens River with the addition of more precipitation in the Mammoth Lakes area after some threatening storms. Some runoff flowed down Hot Creek making the water below the confluence cloudy for a couple of days. The water above the confluence area took on a tea stained red hue while remaining clear. This has now subsided and clearer flows have resumed. The river is now in perfect condition with flows as clear as any angler would desire. This, of course give the fish the advantage as they can see us coming a mile away on the treeless banks of the Upper Owens. The BIG Trout are indeed moving in! They have moved up and are peppered throughout the system. A Fly Angler only needs to take some time explore the deeper parts of the Upper O too find these world class Trout. Right now we are seeing mostly Rainbows as normal, but there is are more Brown Trout and we can see some Rainbows with Cutthroat trout genes as well. Fish the normal suggested flies; Large attractor Nymphs, Small Midges , Eggs, Worms ect.. Streamers always will take fish here but need to be fished in a proper manner in this spring creek type stream . 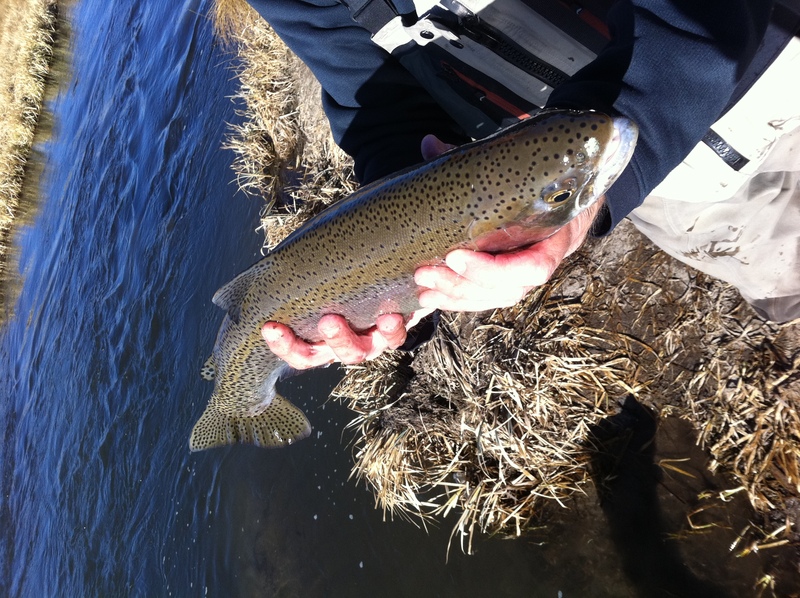 Stay tuned for much more to come from the awesome waters of the Upper Owens River while Fly Fishing this winter.